The Camanachd Association has paid tribute to one of its most distinguished former presidents and best-known personalities of the 20th century, John Willie Campbell, who died in Inverness on Saturday, after a long illness. John Willie, as he was universally known, was born and brought up in Skye where he received his first education. He reckoned that Clachamish was the first-ever shinty academy, producing, as it did, some remarkable exponents of the caman. From the local school he went to Portree and then, after two years’ National Service in the RAF (1957-1959) where he was part of the Mountain Rescue team, he went on to study at the university in Glasgow where he played for the Varsity, won Littlejohn Vase medals and the Southern League title and was awarded a Blue. After graduation in 1961 a long career in teaching in Inverness followed, including marriage to Margaret on 25 July 1963, with his stint at Inverness Royal Academy providing him with one of the highlights of his shinty career. He taught at Inverness Royal Academy from 1961 to 1967; Millburn Academy from 1967 to 1969; then Crown Primary School where he was Deputy Head from 1969 to 1972. In Millburn he was Assistant Rector from 1972 to 1994. Along with the great Ellis Stuart, he managed the IRA senior team’s success in the top schools’ shinty competition, the prized Murchison Cup, winning it with a team which included a young Archie Robertson, who himself went on to be President of the Camanachd Association. Shinty as a sport and way of life owes John Willie Campbell a great deal. The current Association President Keith Loades said: “John Willie Campbell was one of the most significant figures in shinty in the 20th century. He served the game in every capacity from his boyhood as a player in Skye, through university to the full range of administrative duties and responsibilities imaginable. “Within the game he will be remembered as a distinguished president who navigated some quite stormy waters in the 1980s, introduced new structures and competitions, and faced many challenges with a calm and dignified manner throughout. “Beyond the confines of the shinty communities, John Willie was also one of the best-known voices in Scottish broadcasting and an outstanding chronicler of the game’s playing side. 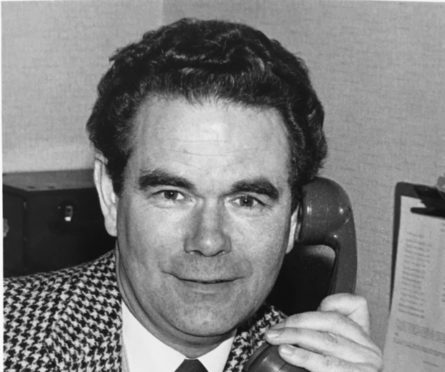 He provided results for BBC Scotland, BBC Highland and Gaelic radio and television throughout that time, as well as writing for national newspapers such as the Scotsman and Sunday Post, and a huge range of local newspapers such as the People’s Journal, Press and Journal, Highland News, and West Highland Free Press. The family had moved to Errogie pre-retirement and from then both he and Margaret contributed greatly to community life. He chaired the local community council and was a Justice of the Peace and Honorary Sheriff. He was a man who placed his family and his faith above all else and will be sorely missed. He leaves behind his wife Margaret, his older sister Mairi in Australia, his son Donald and daughter Shona and his five grandchildren.